Hooray! This is my first image made since I’ve returned to the world of the gainfully employed, and I think you can see that I was a bit tired and desperate when I sat down to lay it out (the decision to plop in an HDRI photo background rather than lighting the scene at all was particularly lazy). I will defend the composition with the fact that my square images are meant to be used as phone and tablet wallpapers, so I give a little more “safe area” on the edges since they’ll be cropped down in those uses. I’m trying to figure out how I’m going to make it through the second half of this project now that my days are no longer my own. The first idea I’ve thought of is to try and lay out several scenes in advance during the weekend, so I only have to worry about rendering and post-work during the week. We’ll see how that works over the next couple days. A quick animation using Foundation 3D’s favorite new spaceship. There wasn’t much excitement to this. A bit of noise added to the camera to give it some wobble (which YouTube insists on trying to “correct”), and the Jupiter map was recolored in the comp to be an alien planet. The cloud plate was a photo I shot with my phone and then enlarged with this on-line tool, though I still had to do some noise reduction in Photoshop. The most interesting thing was a new idea I tried to do the heat haze coming from the engines, which I made using After Effects’ “Displacement Map” filter. 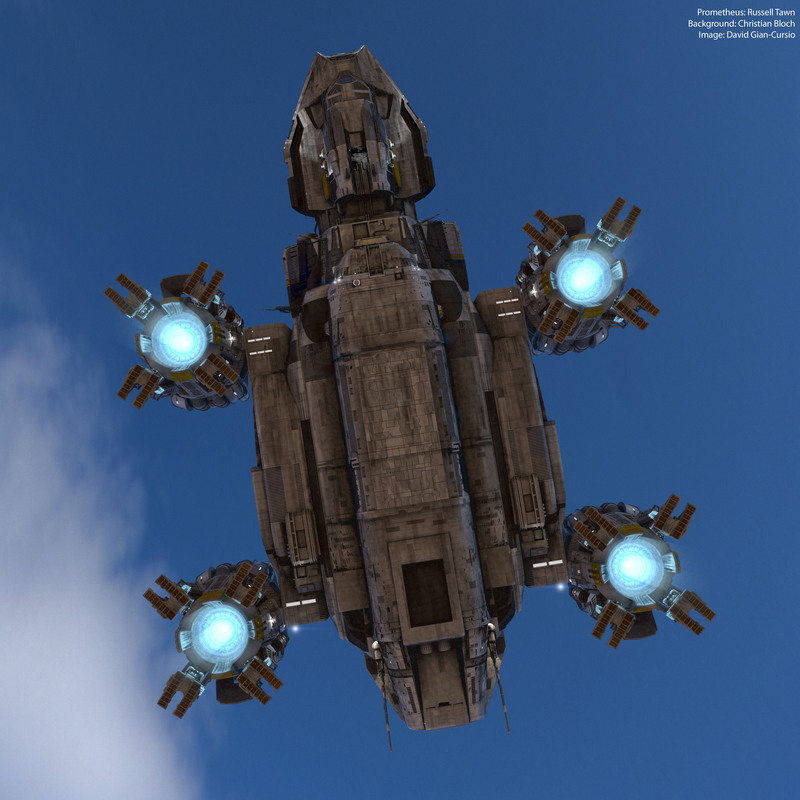 I created a couple of blimp-shaped dummy objects in Lightwave which I placed inside and behind the engines of the ship. I colored the environment and the ship 50% grey for the render, and gave the gave the haze objects an animated black-and-white procedural noise texture. I had the transparency fade towards the rear and edges of the object with gradients. The Displacement Map filter can actually drive horizontal and vertical seperately displacement based on separate color channels. I experimented with using colored noise when I rendered the still frames, but it would only make a real difference in an animation. I also have a trio of 4k stills for your viewing pleasure.